Everyone remembers the old adage “sticks and stones may break my bones, but names will never hurt me,” but in today’s world, this motto is easier said than done. Bloss poses with a friend at a Girls on the Run promotional event. Society idolizes the stereotypical representations of beauty and physique that media outlets commonly present as perfect. The pursuit of achieving the thinnest, most beautiful figure can drive people, especially females, to a point of obsession. Founded in 1996, Girls on the Run has exploded across North America over the past 17 years. Currently, the organization serves over 130,000 girls in over 200 cities with the help of more than 55,000 volunteers. One particular Girls on the Run Council exists right here in Baton Rouge. The South Louisiana branch of the organization leads 14 parishes and is present in 29 public and private schools. Strong leadership and loyal volunteers contribute to the success of Girls on the Run of South Louisiana. According to Hydie Wahlborg, the South Louisiana executive director, Girls on the Run of South Louisiana is the fastest growing council in the nation. The number of teams in their area grows at a rate of about 35 percent per year, and this school year, they will serve over 1,000 girls. 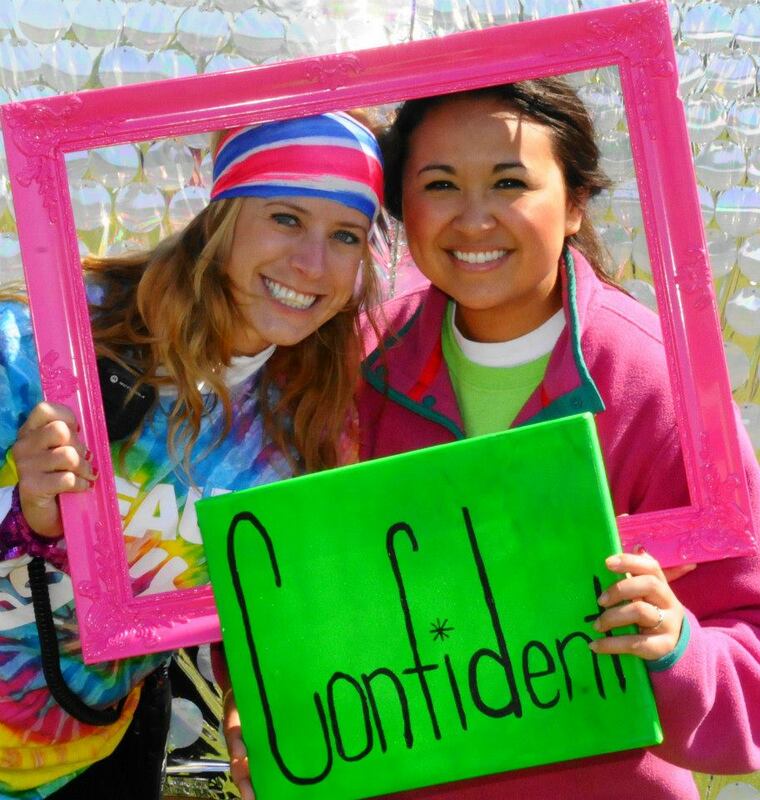 Stephanie Bloss is one of the inspired angels who has dedicated her young life to helping Girls on the Run’s cause. Bloss, program coordinator, manages each school program in all of the parishes. Her duties range from leading biannual coaches’ training, to recruiting new sites and even organizing the end-of-semester 5k. 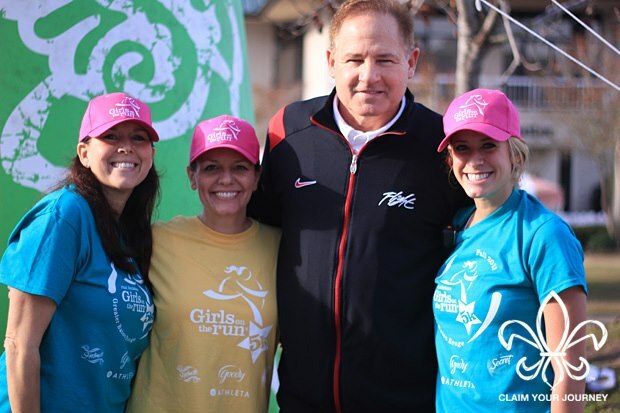 Wahlborg, center, and Bloss, right, pose at the Girls on the Run spring 5k with LSU Coach Les Miles. Bloss says she has always had a passion for inspiring positivity in others. When she came across an opening with the organization in early 2012, she immediately knew it was the exact opportunity for which she had been searching. After a full year of intern work, Wahlborg offered a full-time position to Bloss upon her graduation. Bloss says she and Wahlborg have a very special relationship and have formed a perfect work duo. Increases in the use of social media are progressively transforming the way adolescents interact. Cyber-bullying has become an issue for children across the country, and positive outlets for these young people to escape are needed now more than ever. According to the National Institute for Health, a direct relationship exists between self-esteem and body weight in adolescents. However, attaining a positive body image has become increasingly difficult due to constant pressures from society about what is acceptable. Young people are extremely impressionable, and they need reinforcements to ensure a healthy mindset. If correct information on how to eat healthy and stay fit are taught to youths, they are much more likely to carry those positive habits over to adulthood. Bloss said the Girls on the Run curriculum focuses on several areas, such as bullying, gossiping and self-respect. The goal of the 10-week program is to break down the false ideas placed in these girls’ heads about perfection. The Girls on the Run spring 2013 5k hosted over 5,000 enthusiastic particpants. Numerous testimonies from volunteers and program participants attest to the power of Girls on the Run. Celebrating other’s unique qualities and respecting their fears, as well as recognizing personal doubts, transcends the ugly words said daily. Bloss believes empowering young girls is the most fundamental way to end eating disorders, bullying and social inequality. Below is a timeline of the Girls on the Run history. Also, click the link below to view a slideshow of Bloss speaking about her achievements. 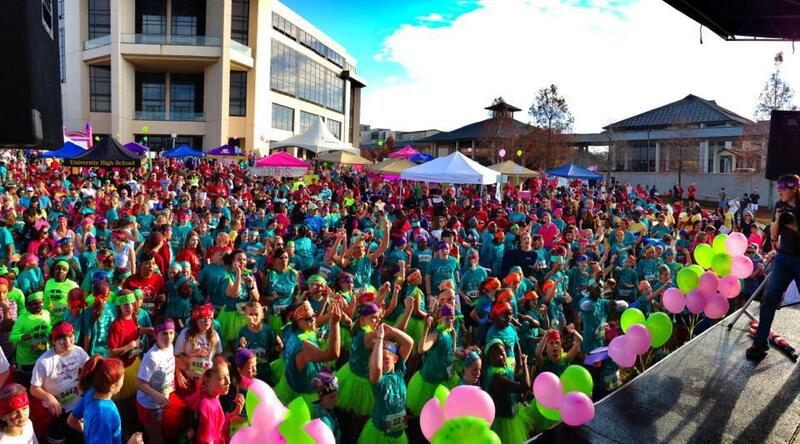 Tags: Girls on the Run, Louisiana, non-profit, South Louisiana, youth. Bookmark the permalink.